Home-grown fresh vegetables and organic potatoes among the areas that will be featured at the first Sustainable Farm Tour Saturday in Antigo and Deerbrook. Saturday's event will feature six local operations devoted to providing potatoes, dairy, fruits, veggies, maple syrup, and meats. Among them are McDougal's Farm LLC and Igl Farms Organic Spuddies. 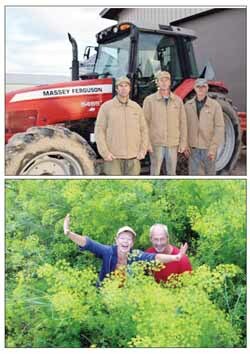 the lower photo shows Maydene and Jerry McDougal having fun at McDougal's farms LLC. Tickets for the day are $5 per person and can be purchased at Sweet Thyme, Green Hen, and Antigo/Langlade County Chamber of Commerce and Visitor Center and at each of the farms the day of the event. For more information on the Sustainable Farm Tour, click here. Located at W10835 Bluebell Rd. in Deerbrook, McDougal's Farms specializes in CSA, an acronym for community sponsored agriculture, which proves weekly fresh-off-the-farm deliveries to local subscribers. The farm, operated by Jerry and Maydene McDougal, grows a diversified selection of quality producer using organic fertilizers, compost, water and sunshine. The McDougals focus on sound sustainable growing practices and pay close attention to soil health, because that's what grows healthy vegetables and families. The guided tour will meander through the patchwork type fields and hoop houses, giving visitors an up close look at the growing methods used to keep the farm sustainable and chemical free. Igl Farms, located at W9689 Cherry Rd, Antigo, is a family-owned and-operated certified organic farm specializing in organic potatoes and direct-marketed grass-fed beef. The farm dates to the 1930s, when it became one of the first commercial potato growers in the area, and today is operated by Tom Igl and his sons, Brad and Brian, as a certified potato and vegetable farm. Several crops are grown in rotation, including potatoes, oats, clover or alfalfa hay with pastureland for a small herd of beef cattle along with horses. The focus is on balancing soil minerals, increasing soil biology and improving soil tilth and structure to create a healthier environment, plants and food for animals and people. Friday: Grandview Orchard & Nursery Stock and Tapped Maple Syrup.